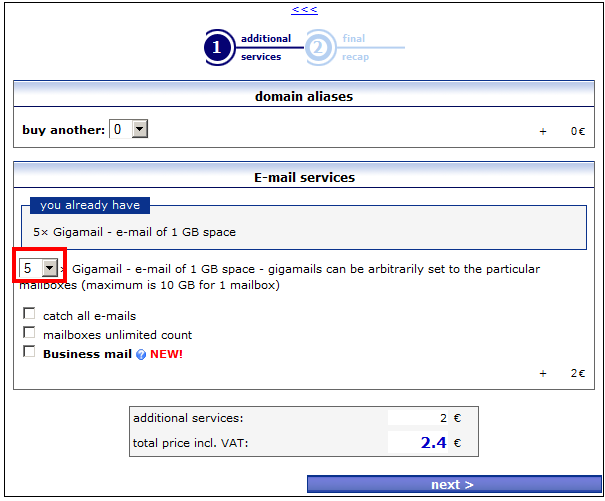 You can activate an additional service FORPSI GIGAMail for your domain. With this service, you can set up to 30 GB space for one mailbox (the quota differs for every plan - Easy up to 10 GB, Advanced up to 20 GB and Professional up to 30 GB mailbox size). In the next window, you´ll see the list of the created mailboxes and their actually used quotas - the basic quota for each box is 1 GB. Their quotas can be freely increased or decreased by simple intuitive way. One suplement GIGA mail includes 5 GB quota, you can arrange from 1 GB for your selected boxes. For the mailboxes director, forpsi, info, postmaster and sales, it is possible to increase the quota (green + button). The mailbox support has the maximum quota, so its quota can't be increased (the + button is grey). For the mailboxes director, info and support, it is possible to decrease the quota (red - button). The mailboxes forpsi, postmaster and sales have the basic size, so their quota can't be decreased (the - button is grey). To change the quota of the chosen mailbox simply click on the green + button (to increase) or on the red - button (to decrease) and confirm it by clicking "Save". Ordering another Gigamail for your domain is easy. Just click on "Order another Gigamail", you see the following window where you select the number of Gigamails that you need and click "next" to complete the order. At the same time, you see how many Gigamails you have already activated. The order can also be done through the offer of the additional services by webhosting or Package.